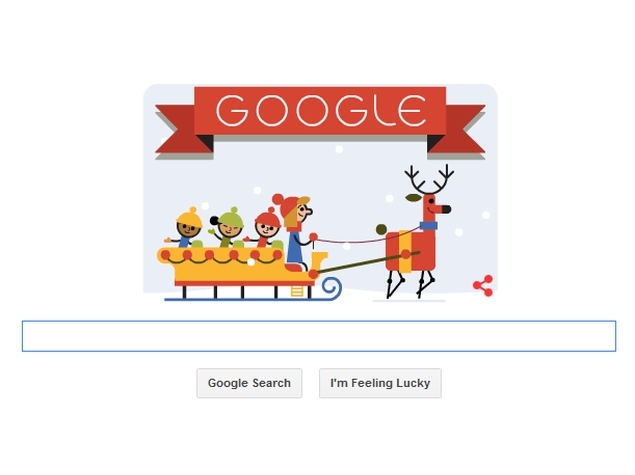 Google, world’s top search engine has wished its users happy holiday season with a ‘Tis the season! Google Doodle on their front page as shown in image. The cartoon character there features a mustached who dressed in the red ski suit, also dragging his suitcase on the snow on a sled. The Google’s engine logo has also been transformed by replacing its primary colors with the festive blue banner which looks really cool. Users are also able to see that amazing banner on the top-left corner of the search results. All over the world, a wide range of groups and religions hold the celebrations in December & January. Christians will surely be preparing gifts & feasts for celebrating Christmas on 25th December – four days after the pagans marked Winter Solstice. While for 16 December, Jewish people have been observing Hanukkah or the Festival of Lights which lasts for 8 days. By lighting the eight candles over the course of holiday, Jews commemorate the re-dedication of the Temple in 165-BC by Maccabees after its desecration by Syrians. Looking forward to an early January, Muslims will remember the life of ‘Prophet Muhammad’ during the Eid Milad ul-Nabi on 2nd January, while on 6th January Orthodox Christians will celebrate the epiphany.